Insect-transmitted protozoan parasites cause widespread and debilitating diseases in man and domestic livestock throughout the tropics. Examples of diseases caused by trypanosomatid parasites include African sleeping sickness (caused by Trypanosoma brucei and transmitted by tsetse flies), Chagas disease (caused by Trypanosoma cruzi) and kala-azar, espundia and oriental sore (caused by the Leishmania). There are no vaccines against these diseases and most of the available drug treatments are toxic and/or ineffective. Parasite surface molecules must protect the organisms and enable them to identify, and interact with, cells of both the insect vector and the animal host. Many trypanosomatid parasite surface molecules are either glycosylphosphatidylinositol (GPI) anchored glycoproteins or GPI-related glycolipids (Fig.1). The parasite GPI biosynthetic pathway, and the pathways that assemble the sugar nucleotides that fuel it and the protein O- and N-glycosylation pathways, are validated targets for the development of new chemotherapeutic agents. (A) The isolation and analysis of parasite surface molecules and sugar nucleotide metabolites using advanced mass spectrometric methods (1-3). (B) Bioinformatics, gene-knockout, cell biology and advanced mass spectrometric methods, to identify, localise and study the functions of glycoprotein (GPI anchoring and protein N-glycosylation) glycosyltransferases and sugar nucleotide biosynthetic enzymes (4-13). (C) The use of quantitative (eg. SILAC) proteomics (14,15) and phosphoproteomics (16,17) methods to determine organellomes, signalling pathways and to identify the modes of action of drugs developed from phenotypic screens. (D) Enzymology to define the properties and substrate specificities of enzymes involved in protein glycosylation, GPI anchor biosynthesis and sugar nucleotide assembly (7-10, 18-21). (E) Drug Discovery, including X-ray crystallography and molecular modelling of drug target enzymes (7-10, 21,22) (Fig.5) (in collaboration with Bill Hunter, Daan van Aalten and the Structural Genomics Consortium), computational chemistry, high-throughput screening and molecular pharmacology (in collaboration with David Gray) and medicinal chemistry (in collaboration with Ian Gilbert and Paul Wyatt). We also have ongoing studies on the proteome and phosphoproteome of T.brucei (14-17). Our ultimate aim is to discover new anti-parasite therapeutic agents for clinical trials through our unique Drug Discovery Unit (23). In addition to our work on parasite glycobiology, we use our expertise in mass spectrometry and proteomics to develop lateral flow diagnostic devices for human and animal trypanosomiasis (24-27). Ryan, C. M., Mehlert, A., Richardson, J.M., Ferguson, M.A.J. *, Johnson, P.J. * (2011). Chemical structure of Trichomonas vaginalis surface lipoglycan: a role for short galactose (b1-4/3) N-acetylglucosamine repeats in host cell interaction. J. Biol. Chem. 286, 40494-40508. *Joint senior authors. Mehlert, A., Wormald, M.R. and Ferguson, M.A.J. 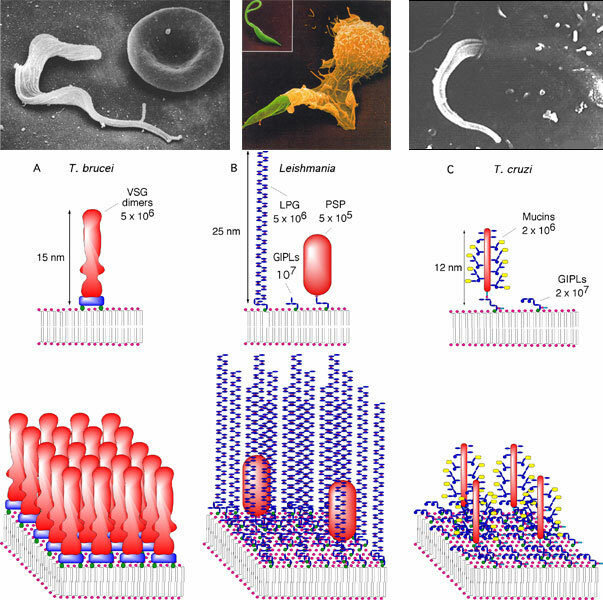 (2012) Modeling of the N-glycosylated transferrin receptor suggests how transferrin binding can occur within the surface coat ofTrypanosoma brucei. PLoS Pathogens 8, e1002618. Allen, S., Richardson, J.M., Mehlert, A and Ferguson, M.A.J. (2013) Structure of a complex phosphoglycan epitope from gp72 of Trypanosoma cruzi. J. Biol. Chem. 288, 11093-11105. Izquierdo, L., Schulza, B.L., Rodrigues, J.A., Güther, M.L.S., Proctor, J.B., Barton, G.J., Aebi, M. and Ferguson, M.A.J. (2009) Distinct oligosaccharide donor and peptide acceptor specificities of Trypansosoma brucei oligosaccharyltransferases. EMBO J. 28, 2650-2661. Güther, M.L.S., Beattie, K., Lamont, D.J., James, J., Prescott, A.R. and Ferguson, M.A.J. (2009) The fate of GPI-less procyclin and characterisation of sialylated non-GPI anchored surface coat molecules of procyclic form Trypanosoma brucei. Eukaryotic Cell, 8, 1407-1417. Marino, K., Güther, M.L., Wernimont, A., Amani, M., Hui, R. and Ferguson, M.A.J. (2010) Identification, subcellular localization, biochemical properties and high-resolution crystal structure of Trypanosoma brucei UDP-glucose pyrophosphorylase. Glycobiology, 12, 1619-1630. Keuttel, S., Wadum, M.C.T., Guther, M.L.S., Marino, K., Riemer, C. and Ferguson, M.A.J. (2012) The de novo and salvage pathways of GDP-mannose biosynthesis are both sufficient for the growth of bloodstream form Trypanosoma brucei. Mol. Microbiol. 84, 340-351. Bandini, G., Mariño,K., Güther, M.L.S., Wernimont,A.K., Kuettel, S., Qiu, W., Afzal, S., Kelner, A., Hui, R. and Ferguson, M.A.J. (2012) Phosphoglucomutase is absent in Trypanosoma brucei and redundantly substituted by phosphomannomutase and phospho-N-acetylglucosamine mutase. Mol. Microbiol. 85, 513–534. Damerow, M., Rodrigues, J., Wu, D., Guther, M.L.S., Mehlert, A. and Ferguson, M.A.J. (2014) Identification and Functional Characterization of a highly divergent N-Acetylglucosaminyltransferase I (TbGnTI) in Trypanosoma brucei. J. Biol. Chem. 289, 9328-9339. Izquierdo, L. Acosta-Serrano, A., Mehlert, A. and Ferguson, M.A.J. (2015) Identification of a glycosylphosphatidylinositol anchor-modifying b1-3 galactosyltransferase in Trypanosoma brucei. Glycobiology 25, 438-447. Nett, I.R.E., Martin, D.M.A., Miranda-Saavedra, D., Lamont, D.J., Barber, J.D., Mehlert, A. and Ferguson, M.A.J. (2009) The phosphoproteome of bloodstream form Trypanonosoma brucei, causative agent of African Sleeping Sickness. Mol. Cell. Proteomics 8, 1527-1538. Urbaniak, M.D., Martin, D.M.A. and Ferguson, M.A.J. (2013) Global quantitative SILAC phosphoproteomics reveals differential phosphorylation is widespread between the procyclic and bloodstream form lifecycle stages of Trypanosoma brucei. J. Proteome Res. 12, 2233−2244. Urbaniak, M.D., Collie, I., Fang, W., Aristotelous, T., Eskilsson, S., Harrison, J., Hopkins-Navratilova, I., Frearson, J.A., van Aalten, D.M.F. and Ferguson, M.A.J. (2013) A novel allosteric inhibitor of the uridine diphosphate N-acetylglucosamine pyrophosphorylase from Trypanosoma brucei. ACS Chemical Biology, 8, 1981-1987.